Wednesday was a good day. Sitting in my sons’ room before 5am my mind started to float between dream and consciousness. That’s when the idea came. By 6 a.m. I was ready to write and the thought of having to wait was killing me. At 8 a.m. I could wait no longer. I left the kids playing with their dad and went to have a “shower”. As I sat in the bedroom, not taking a shower, I wrote. Thankfully, for my husband and the kids, it was a one-page script. I have now typed it up and re-written. 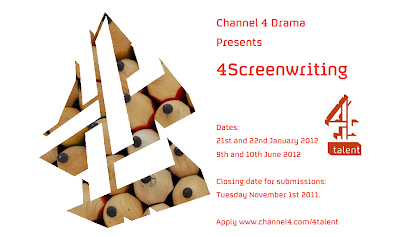 This is my entry for a competition for the upcoming London Screenwriters’ Festival. If you know of any other current opportunities, please leave a note in the comment section and I'll add it to the list.